I’ve returned from 221b Con, with about a week until the official launch of The Detective, The Woman and The Pirate’s Bounty. At the convention, I was reminded of one of the great joys of being a Sherlockian, the fact that everyone is different and we can all enjoy Sherlock Holmes in the way that excites us. My microcosmic example of this was in interactions with people who bought pre-release copies of my book. One loved the idea of historical Floridian pirates being included. One enjoys my portrayal of women. Another is partial to my particular characterization of Irene Adler. These interactions are a small example of the wider truth that a convention like 221b Con always shows me: we’re all in this deerstalker-clad Holmesian world for our own reasons, and when we gather to share those reasons, magic happens. As always, I heard people advocate for adaptations I dislike and criticize those I enjoy. I heard passionate challenges and spirited defenses. It was all mad, fascinating, and wonderful. Just like a night pursuing pirates in the Florida islands. The Detective, the Woman and the Pirate’s Bounty is available from all good bookstores including Amazon USA, Barnes and Noble USA, Amazon UK and for free shipping worldwide Book Depository. In ebook format it is in Kindle and Apple iBooks (iPad/iPhone). The Detective and The Woman series is available from all good bookstores including The Strand Magazine, Amazon USA, Barnes and Noble USA, Amazon UK, Waterstones UK and for free shipping worldwide Book Depository. In ebook format it is in Kindle, Kobo, Nook and Apple iBooks (iPad/iPhone). I can’t believe it. It’s finally almost time! My newest novel of Sherlock Holmes, The Detective, The Woman and The Pirate’s Bounty, will launch in April of 2019. The road has been a long one. I wrote the first draft of the book while I was undergoing chemotherapy, and I edited it during periods of repeated surgery and health issues. As always, Sherlock Holmes and Irene Adler rose to the challenge. They distracted me and lifted my moods while I roamed island sands with them and researched the real-life stories of Florida’s coastal pirates. I’m immensely thrilled that out of a difficult chapter in my life, a piece of creativity could be launched and finally make its way into the world. I certainly hope you enjoy a tale of treasure, organized crime, adventure, and deduction! p.s. If you’re attending 221b Con, I’ll be there with the Baker Street Babes and copies of the book that I’ll happily sign. A few days ago, I completed my panelist application for 221b Con 2019. It’s gotten me thinking; I know a lot of newer Sherlock Holmes enthusiasts come to Holmes from worlds of convention attendance and shared fan experiences, but I didn’t. I’ve been to exactly one fancon other than 221b Con, Dallas Comic Con, where I had no idea what I was doing. I’m not even someone who frequented more formal academic enthusiast settings like symposiums or lectures; my area is not rife with these things. As a result, I had no idea when I started attending 221b Con that it would become such a significant part of my life. I went from wondering if I would even enjoy myself to feeling profoundly connected with other Holmesians in a way I never had before. 221b Con is where I sat on my first panel, where one of my novels was first selected for the official book club, and even more importantly where I met and made dear friends who have enriched my experience as a fan and as a creative. It’s also where I finally met other Baker Street Babes in person. So, once again, I find myself planning a trip. But it doesn’t feel like a trip to a hotel or a big city. It feels like I’m taking a trip back to Baker Street, and I’m going with friends. I am familiar with Elizabeth Varadan as an accomplished Sherlockian author, particularly of the children’s book Imogene and the Case of the Missing Pearls, which is my favorite pastiche for young readers that I’ve ever read. As a result, I was intrigued when I heard about her new book The Carnival of the Animals, an anthropomorphic animal fantasy with ties to the composer Camille Saint-Saëns. I am thrilled to present my interview with her and to discuss her new, adventurous work. 1. I know you as an accomplished Sherlockian author. What brought you inspiration for this different genre? Actually, I wrote early drafts of Carnival of the Animals before I wrote my Sherlock Holmes mystery, Imogene and the Case of the Missing Pearls. I’ve always loved music, and Camille Saint-Saëns’ musical fantasy inspired the book one night when my husband and I heard it on the radio. Semi-jokingly, I said, “I should write a set of stories based on this music.” And then we both became quite enthused over the idea. But each story was so distinct and called for so much research, it was like writing 14 separate storybooks. It took a long time and lots of rewrites. Meanwhile, I’ve always loved reading mysteries, especially any that involve Sherlock Holmes. While I was pondering rewrites of Carnival, I started toying with the idea of a Sherlock mystery for children. And, like the Carnival stories, I was suddenly hooked on the idea and just ran with it. 2. As a reader, I feel like Carnival of the Animals could appeal to any age of reader. What do you think? It’s nice to hear you say that! I like to say it’s for children ages 7 to 70. 7-year-olds may need to have the stories read to them, but by 8 they can probably read the stories themselves. The stories are told in fairytale/folktale style, which makes Carnival clearly a children’s book. But they are also layered with themes that appeal to older readers and adults as well. There are references to literary classics as well as using legendary figures from myths of other lands. It was great fun to work in so many levels. 3. How do you get into the minds & personalities of animal characters? Is it different from humans? That’s such an interesting question. I suppose I just treated the animals as if they were humans. More and more, scientists are discovering that animals have emotions, communication systems, even cultures that go far beyond mere instinct. They may not be able to do mathematics, but apparently quite a number of species “problem solve”, which was once thought only a human characteristic. It helped, too, I suppose, that I read Aesop’s Fables and some aboriginal stories around the world, where animals speak and think and do very clever things. 4. If you only had a few lines, how would you introduce the book to a new reader? If you like animal stories, stories that take place in other lands and other times, and stories that involve a little magic . . . this book is for you. 5. Finally, do you have any Sherlockian plans for the future? Yes, I do! Several readers have said they hope there will be a sequel to Imogene and the Case of the Missing Pearls. So, I’m working on one now. I have about three more adventures in mind. As Elizabeth elaborated on above, Carnival is a collection of stories that feel timeless in their stylistic similarities to animal-based folk and fairy tales of the past but are entirely new and fresh at the same time. Elizabeth brings a Sherlockian emphasis on detail and a luscious but accessible writing style to each of her books, and this one is no exception. Children and adults alike will be enthralled by her beautiful and encompassing world and the charming animal characters she introduces. Readers of tales like Kipling’s or Aesop’s will find much to love, but this book is also an excellent entry point for any young animal lover who has yet to discover the treasure trove of animal fantasy literature. This book will delight young and old minds and provide an accessible challenge for very young readers, while being fun for the whole family as a read-aloud book. Highly recommended. A copy of the above-referenced work was provided for consideration by the author, but all opinions expressed are the reviewer’s own. I have a few Holmesian irons in the fire these days. I recently passed the milestone of my first professionally-published poem, a musing on the character of Violet Smith from “The Solitary Cyclist” and her first meeting with Holmes, which leads off a new story anthology. Now I’m working on the creative stages of a promised new pastiche, but I’m also passing through that oft-dreaded stage of another novel: Final Editing. Except, I’m enjoying it. I’m enjoying the strange process of verbal weight reduction, looking at the sum of what’s on the page and trying to figure out what the true figure of the story is without unnecessary fat. Of course, Holmesian editing has its tedium: eliminating anachronisms, checking plot coherence, banishing repetition. The fun, to me, comes in finding the characters. Both Holmes and Irene Adler figure heavily in my stories, but I find Holmes the more challenging of the two to write. When I read the Canon, I often feel like I’m searching for an elusive man, that the real mystery is in unlocking the inner life of one of the most enigmatic, in some ways, characters ever written. As a writer, the challenge is similar. I write Holmes as I believe he is, and then go back to what I’ve written to see if the angular, charismatic man staring back at me feels like the one I read about. It can feel maddeningly subjective, but it’s rewarding. Perhaps part of why I continue to write Holmesian novels is simply, in the end, to find Sherlock Holmes. We’re entering the holiday home stretch, but if you’re still looking for gifts or stocking stuffers for the Holmesians in your life–or maybe for how to spend those giftcards coming your way–we have a few suggestions. Christmas delivery is still in sight, and books can be gifted electronically, so don’t despair. 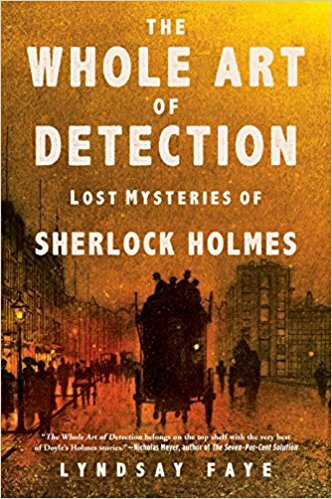 No Holmes enthusiast needs to be disappointed this holiday season! 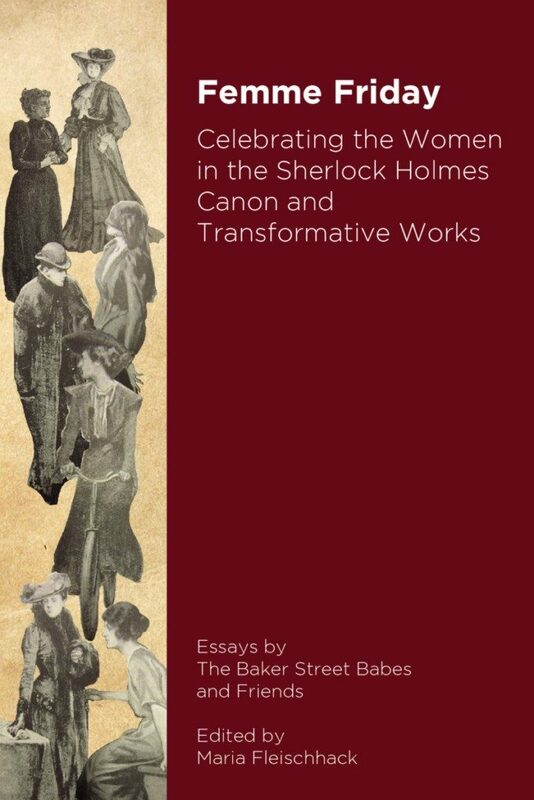 Available here, Femme Friday is the latest release by the Baker Street Babes and friends and is an essay tribute to the women of the Sherlock Holmes Canon and adaptations. Penned by women of all ages and all walks of life, it’s an analytical, insightful celebration of women by women. 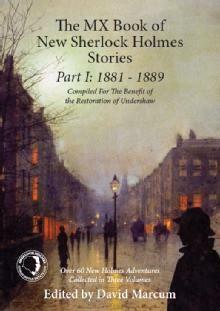 Available here and now in several volumes including a Christmas anthology, the MX Book of New Sherlock Holmes Stories is perfect for the Doyle Canon lover who wants to dive into a host of new short story pastiches that adhere to a traditional interpretation. The Baker Street Babes are responsible for several stories across the series and are proud to be part of contributing all series royalties to Undershaw and the school for special needs children that resides there. Available here, Lyndsay Faye’s latest release collects her greatest Holmesian short stories from the Strand Magazine and unites them with new tales filled with adventure, wit, and heart. Described by several reviewers as the best pastiche collection published in many years, Lyndsay’s stories will delight readers of all ages, stripes, and points of entry into the Sherlockian world. Available here. 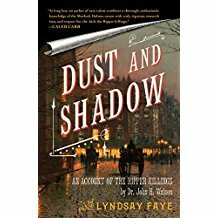 So good she had to be listed twice, Lyndsay Faye’s novel-length pastiche connecting Sherlock Holmes with the Jack the Ripper investigation is a modern classic of the genre and a must-read for fans of Victorian Holmes. Available here. 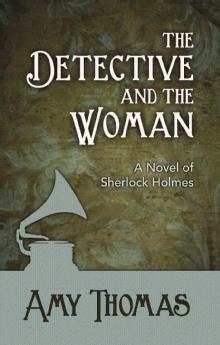 Traditionally nontraditional, The Detective and The Woman (and subsequent books Winking Tree and Silent Hive) feature a mystery-solving partnership between Sherlock Holmes and a strongly-realized Irene Adler as they confront threats that take them to Florida, the Sussex Downs, and the London streets. Available here. 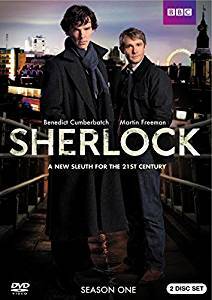 Relive the glory days of the first seasons of Sherlock with deluxe DVD and Blu-Ray sets that will delight the fans of Cumberbatch and Freeman, as well as the tightly-plotted web woven by Andrew Scott’s Moriarty. 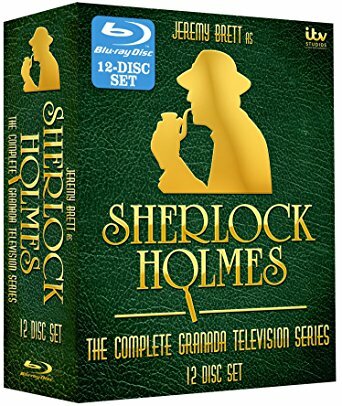 Available here and considered by many to be the definitive Sherlock Holmes adaptation for all time, fans of the mesmerizing performance of Jeremy Brett will be delighted by this collection that contains every episode of this iconic series. Available here. 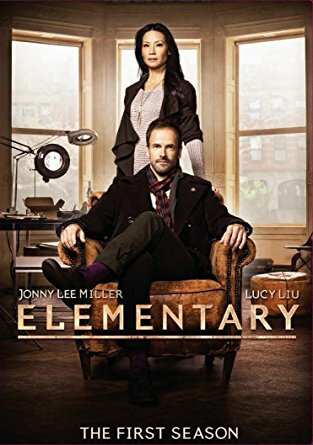 Witty and idiosyncratic, Elementary continues to delight television audiences and gain new fans with its ultramodern take on Sherlock Holmes and Dr. (Joan) Watson. Recent fans may not have had a chance to catch the first few seasons and will enjoy delving into hours of mystery-solving fun, including the mindbending and memorable guest role of Natalie Dormer. Available here. Without Rathbone and Bruce, the history of Holmes on screen is incomplete. 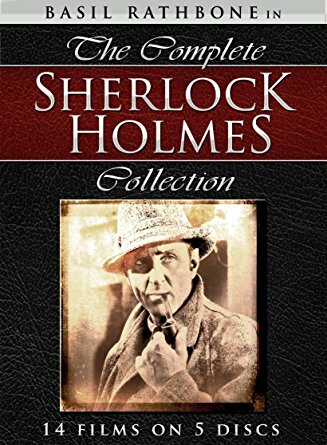 Relive the thrilling classic films that saw Holmes fighting Nazis and proving himself as a man of action long before Guy Ritchie came along. Available here. 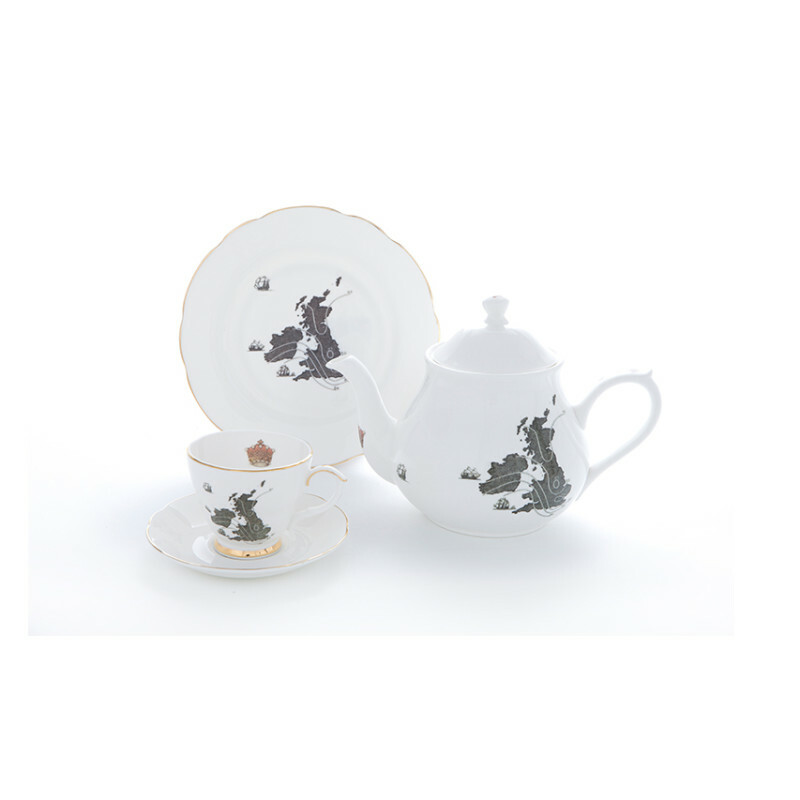 Ali Miller’s beautiful tea set is not only a delightful object in its own right, but is also featured, along with other Ali Miller designs, in the BBC’s Sherlock. The Home Sweet Home set pictured here is seen in the iconic Baker Street tea drinking scene when Moriarty visits Holmes at 221b Baker Street. Available here. 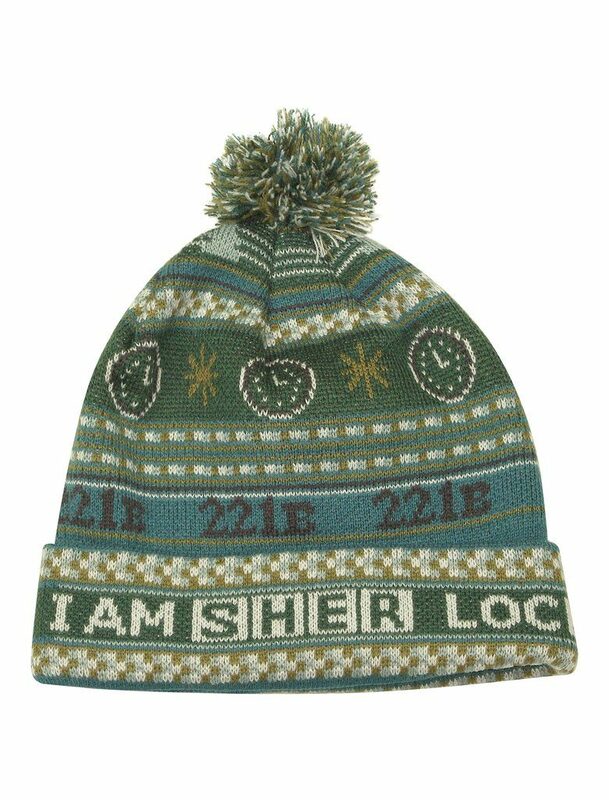 Lovarzi’s delightful and stylish winter collection of Sherlockian hats and scarves will turn heads for years to come.